Garden and lawn irrigation systems for the average homeowner range from portable lawn sprinklers to automatic sprinkler systems, drip irrigation, and rain barrels. But which one to choose? Each system is designed to deliver water to your garden in a different way, so the best garden irrigation plan is one that uses a combination of methods. Here's some ideas for combining watering systems, gizmos, and gadgets for an all-around home irrigation system that promotes water conservation and reuse. For lawns, groundcovers, and large shrub borders, an underground sprinkler system will evenly soak every square foot with at least one inch of water once or twice a week. 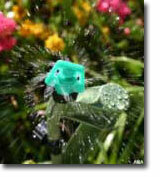 Sprinkler systems from well known brands such as Rain Bird, Nelson, and Hunter are usually professionally installed. However, you can save money by designing and installing an automatic sprinkler system yourself. Everything you need to know is explained in Scott Young's ebook "Build Your Own Sprinkler System". When there is no sprinkler system or drip irrigation available, use portable lawn sprinklers to water areas of lawn and garden. These are readily available and easy to use. For perennial borders, shade gardens, and hedging, a drip irrigation system delivers water right to the roots of plants instead of to weeds and walkways. They are easy to install, relatively inexpensive, and in many cases can be used during water restricted seasons. The low flow rate ensures that plants are watered efficiently at the roots. For your vegetable garden, which typically needs thorough watering daily, a drip irrigation system is ideal. Now, connect that with a rain barrel that collects rainwater from your down spouts and gutters, and you'll have a great water re-use plan. Harvested rainwater does not contain chlorine, fluoride and other chemicals and is a great choice for watering vegetable and herb gardens. If hand watering your garden is your desire, then get one or two long hoses made from reinforced rubber/vinyl and a variety of portable lawn sprinklers, hose quick disconnect attachments, sprayers, nozzles, water wands and the like. Store your garden hose correctly in a sturdy garden hose reel either wall mounted or on wheels. To water patio pots and hanging baskets while you're away, try a patio drip irrigation kit. These kits are inexpensive, convenient, and great for vacation watering. You just run the drip microtubing between pots and baskets and then forget about it. You won't come back from holidays to find your mixed hanging basket ready for the compost. Self watering pots have built in reservoirs that provide consistent low rate water absorption by the plant. Other self watering products such as cones, capillary matting, and water rings are also available for short to long periods of time away. Watering Tomato Plants – What Is The Right Tomato Watering Frequency?